Summer is over and Bootie knows it's time for school -- but that doesn’t mean you have to put your nose to the grindstone yet! 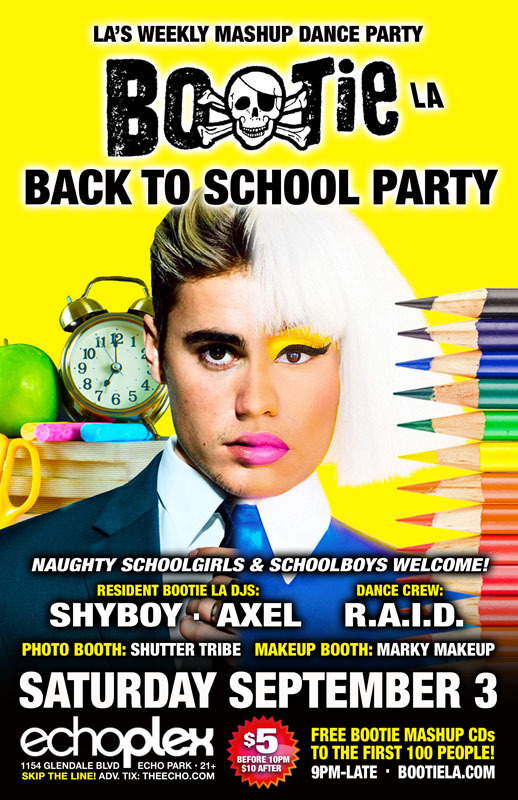 It’s Bootie’s Back to School Party! Resident mashup professors ShyBoy and Axel will keep your minds off school all night long, throwing down the best mashups in the world to fill your minds with fun, not facts! Only $5 before 10 PM! Naughty schoolgirls and schoolboys welcome! It’s Bootie’s Back to School Party, but unlike some institutions of higher learning (and nightclubs), Bootie encourages you to break dress codes – we know you’d want to wear your naughty school uniforms and letterman jackets anyway, even if it’s not required, as well as all the clothes that schools banned, like mini skirts and shorts, T-shirts with bad words, and tight or ripped jeans! Resident professors ShyBoy and Axel will give an education in mashup history, as they keep your bodies bouncing across the quad at Echoplex U! Bootie LA’s resident dance crew R.A.I.D. (Random Acts of Irreverent Dance) will keep your studies going with their go-go antics, plus Marky Makeup gives you a scholastic makeover and house photographers Shutter Tribe capture all the action.